So I'm just about to upgrade my current 300g reef to the new tank that I'm building which is a ~1100g tank, 16'x'3'x3 (plus the sump). I'm super interested to get your input on if there's any chance of success mixing Acanthurus tangs such as Powder Blue, Brown, Black, and Achilles (there will be other tangs such as Naso, Regal, Convict, Scopas, Purple, Yellow, Sailfin &c) along with wrasse and Anthias, along with a decent amount of rockwork/coral. I know that this would normally be a total no-no, but given such a large tank + introducing them at the same time, is this all but guaranteed to fail or is there any likelihood of success? I know that these fish school in the wild, at least with their own genus. My plan would be to quarantine them all separately, and then introduce the acan's together (with the other fish already in the established tank). I'd probably do it on a weekend so that I could monitor the situation and extract a fish if need be-but obviously if you just think this is a terrible idea then I wouldn't attempt it. Appreciate any guidance you have to share! I was thinking that this approach would be somewhat similar to African cichlids where you distribute the aggression so it's not a 1:1 battle. Just wasn't sure if that was likely to work with these tangs. I'll definitely keep you guys updated and will provide some pictures! I am in the process of slowly stocking my 200 gallon reef tank. I currently have a yellow tang, Kole tang, tiny hippo tang, a pair of ocellaris clowns, a radiant wrasse and pink margin fairy wrasse. All are quite healthy and get along reasonably well. My newest attempted addition is an Acanthurus chronixis, just starting to turn from his half black angel mimic phase. It's a beautiful golden brown and perhaps the Kole tang is jealous of his beauty because he was instantly on the mimic tang with tail beatings. I put the mimic in an acclimation box attached to the side of the tank and kept him there three days. After what appeared to be disinterest by the Kole, I let him out only to have the tail beatings begin again. He is once again in the acclimation box. How long can I keep him in the box? How long before I give this up as a lost cause? and if so for what length of time? Thanks in advance for your always excellent advice. I have a 233 gal reef tank and I have a medium Bariene Tang in there and wanted to know would it be ok to put a Powder Blue Tang in there as well? Was cleaning my saltwater fish tank and my clown tang just punctured my thumb with his back spikes. Im bleeding and it stings. Do you know if they are poisonous and if I should be concerned? I'm in the process of building a 260 gallon wall mounted tank in the house my partner and I are building. and she's outgrown my current 90 gallon. I don't feel right keeping her in those conditions for another 7 months, so she's going to a much more suitable 700 gallon reef a friend of mine is building. I'm researching possible replacements, and I'm quite enamored with the Vampire/tennenti tang. I can't find much info on this fish, but as it will be a smaller animal than my Sohal, I don't want it to be my only Tang, if I get one. I've read that tennentis are quite docile, but I'm not sure if I could pair a Powder Blue with a tennenti in a 260 gallon system if I bought the Powder Blue quite small. Any feedback would be appreciated, and merry Christmas! 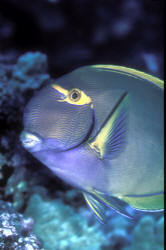 Fish community In a 55 fish only tank how would a powder blue tang, Niger trigger, flame angel, true Perc clown do?. I really like the powder blue tang, if the rest won't get along >> Powder Blues (Acanthurus leucosternon), are not easy to keep... especially in a non-reef setting... Please do read over the materials stored on the www.wetwebmedia.com site re this species... I can't discourage you enough in pursuing this species for a FO set-up... Very prone to ich/Cryptocaryon... need to be thoroughly dipped/quarantined... placed in LARGE, ESTABLISHED reef settings.... then, still half die within a month, ninety percent plus within three.... Bob Fenner, who says, the other livestock sounds okay... maybe look into another tang species?